The Postman will carry his mail through sleet and snow, rain and hail, to get it to it’s destination, but mailmen have nothing on agitated college students protesting massive budget cuts. A group of approximately 100 students and faculty trekked through light-yet-constant rain in an almost two mile march from Cesar Chavez Student Center to the City College of San Francisco. The group departed from SF State around 1 p.m. and walked in a large and shuffling line through Junipero Serra Boulevard, following Ocean Avenue all the way to CCSF. Marisa Soski, 20, biology major at SF state and member of SQE, said that this cause was important because students are being ignored. Through the rain, students carried signs as a stream of caution tape held by volunteers separated them from the road, and police stopped traffic when protesters crossed the street. Every student had their own reason for marching, whether it was the impending budget cuts or a broader-scale problem such as US imperialism. Either way, students felt that the turn out could have been greater. 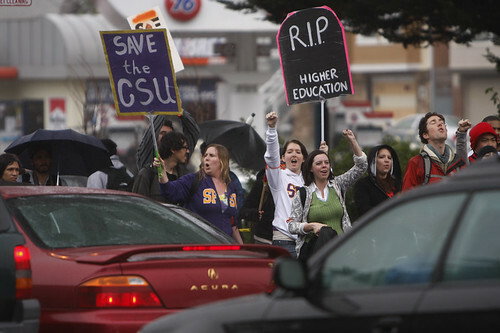 Once at CCSF the marchers were met with a handful of extra marchers and several speakers. Jeremy Miller, co-director of Education Not Incarceration, a non-profit group fighting for student rights, had impassioned words to pass on to marchers. “Diamond Dave”, 73, an elected senator of CCSF for four years, also supplied food for all the marchers including spaghetti as part of a program he entitles “Food not Bombs.” Through food, he hopes to change the world one bread roll at a time. “People need to be fed, otherwise it’s just like the rest of the world, and you’re just taking from people,” Dave said. Diamond Dave said that marching was just the start of potentially great changes to come.